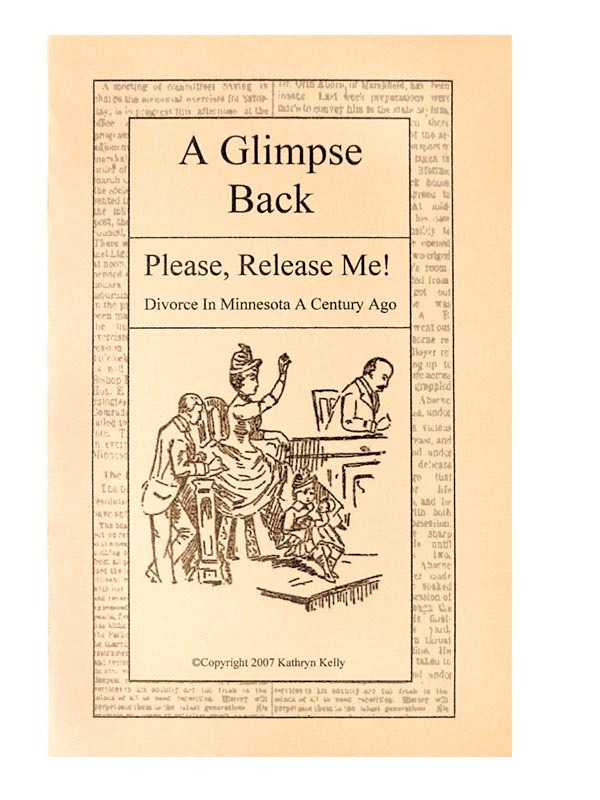 KinSource - A Glimpse Back - Please, Release Me! They laughed, they cried, and they had their stories printed in the local newspaper for everyone to see! Newspapers, in the late 1800's and early 1900's, wrote in entertaining detail about the love lives of average, everyday people. Do you really think that times have changed since then? Read Please, Release Me!, and find out!! From the story "Left With A Bride"
"Two weeks ago Father Heffron refused to marry a tall, soldierly looking man and a plump red-cheeked woman, who made their appearance at the cathedral at 6 o'clock in the morning. The refusal was not on account of the early hour, but because he had received a tip that the tall man was already the husband of an equally attractive woman, who is a resident of the West side, and a well-known actress." Please allow 2 weeks for delivery. Questions about using PayPal? Common Good Books, 165 Western Av. N., St. Paul, Mn. Minnesota History Center, 345 Kellogg Blvd. W., St. Paul, Mn. This book is 40 pages long with short articles (1 to 6 pages each), so this is perfect for reading when you have a little free time. It is also a great gift for that friend or relative who loves to read, or the history buff interested in reading about the lives of people a century ago! Names appearing in this book: Edward Strevesky, Mary Strevesky, Judge McGee, Ralph Schaft, Fay Schaft, Harry Cotton, Elmer F. Scheig, Annie M. Paul, Edward Paul, John Long, Sergeant Charles Hanft, Assistant County Attorney Pierce Butler, Capt. Walsh, Walter Holcombe, Judge Brill, John J. Mullen, Elizabeth Mullen, Deputy Sheriff Lunkenheimer, Isaac Katz, Ida Katz, Freda Katz, Joseph Scheirman, Maurice Spitta, Florence Nowiska, Thomas Nowiska, Joesph Kallas, Augusta Adamm, Frederick Adamm, Carolina Adamm, Caroline T. Voss, Charles F. Voss, Albert Gang, Judge Charles S. Jelley, Frank Sepple, Laura Sepple, Annie Engler, Deputy Sheriff A. P. Schoenart, Judge Rea, Mr. Hodsdon, Mrs. Hodsdon, Romenia Hodsdon, Mr. King, Mrs. Hall, Father Heffron, Annie C. Broderick, Jane Hoyt, William H. Souser, Congressman William H. Burroughs, Orrin H. Hoyt, Jane Hopkins, Booth and Barrett, Janauschek, Kate Claxton, Dion Boucicault, Marion Gray, Maggie "the St. Paul midget", Secret Officer Walsh, William H. Cody, John Rolland, Rhoda McClelland, Thomas B. Beal, Mary Beal, Ethel Beal, Rev. W. K. Marshall, Annie F. Burns, William H. Redfield, Mary Martinson, Alexander Flanders, Mrs. Flanders, Judge S. D. Hastings, John J. Robertson, Bessie Raymer, C. D. Raymer, James J. "Gentleman Jim" Corbett, Mrs. Corbett, Gene Clarke, Mrs. Kempster, Agnes Kempster, Fred Folsom, Dr. Evans.